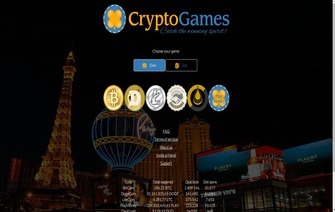 Launched in August 2014, Crypto-Games.net was launched as a “provably fair” dice and slot cryptocurrency casino and has been steadily gaining a decent player base since its launch. When a player first arrives at Crypto-Games.net, the aesthetics of the site itself will most likely not impress the average player. It is a very simply laid out design, with nothing more than the choice of game, along with the cryptocurrency the player can choose to play with, a “Terms of Service” link, a Frequently Asked Questions link, an “Invite a Friend” link, and finally a “Support” link that will directly link to the support email address. Featured below that are the statistics of total amount of crypto-currency wagered, to date, and a small ad banner. Although it only contains very little as far as content on the site, it is very much designed as a quick place to play with crypto, and without all the bells and whistles of other feature loaded sites that are out on the market. As mentioned above, Crypto-Games.net currently only provides two different types of games. A slot game that provides a provably fair algorithm to its play and also a dice game that also has a provably fair algorithm base, as well. Each game is fairly simple to play as the dice game is like most others that the Bitcoin community has seen and the slot game is likewise, very simple. Crypto-Games does not offer a welcome bonus at the moment but the quality of their service and the big dose of honesty, makes them a valid choice among bitcoin casino players regardless the lack of a bonus policy. The best feature that Crypto-Games.net offers is it’s very quick deposits and withdrawals. Deposits are confirmed after only a single a confirmation and immediately credited to the account. Withdrawals are also processed and 99% of the time, are usually processed before the next Blockchain confirmation. Higher withdrawals are of course reviewed, but those usually do not take more than 10 minutes to complete. Customer support is usually very quick in terms of email or through PM’s on BitcoinTalk, but the only setback to the support is that those are a player’s only two options, which by today’s standards, is not quite up to par. Although that may be the case, problems seem to rarely ever arise to need an urgent support inquiry, but when they do, Crypto-Games is quick to respond. Crypto-Games.net was not built to be a fancy online Bitcoin casino, so players expecting that will be greatly disappointed. It was built for a simple, provably fair way of providing players an opportunity to have fun, without all the glitz and glamour of what bigger casinos may provide. Its prompt banking and its timely customer support really bodes well for Crypto-Games future. As they unveil more games into the future, they have the most important parts down pat, banking and support.